Oh, my title just makes me laugh. You will see where it comes from as the post goes on. Nothing bad I promise. A couple of months ago one of my biggest supporters for my blog decided to take a very early retirement. Kim is one of the nicest and funniest people you could ever know. 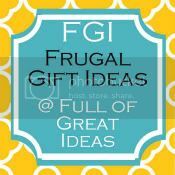 Other than parents, I have not have not known anyone else to retire, so when it came to gift ideas I was stumped. As I always say, I knew I wanted her gift to be personal and something she could use but I had already made her the name art and the monogrammed tile, so I had to come up with something completely new. 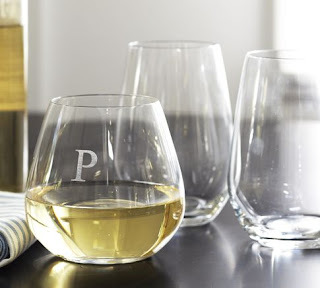 After heading over to the amazingly inspiring Pottery Barn site, I decided on making monogrammed stemless wine glasses and marble tile coasters (I will share this simple gift idea tomorrow). 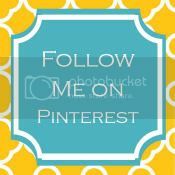 The Pottery Barn glasses are over $50 for 6, and I created mine for under $20 for 8. I purchased eight reasonably priced stemless wine glasses from a local home store so they can be for everyday use and no one has to worry about them breaking. 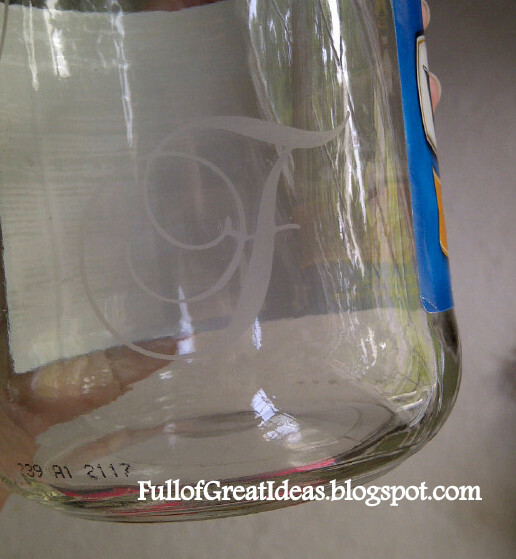 I tested out a few different initials on a old pickle jar just to ensure I had the right sizing and to see which design I liked the best. I knew I was saving all those jars for a reason. Hopefully now my husband can't say anything about the stash again. Are you the same... you look at jars and think "Oh I know there is something I can do with that in the future" and it hurts you to throw them in the recycling bin? I liked them both, but I found the large circle to be a little heavy for wine glasses. I also find that with the etching cream, large surfaces don't seem to be consistently etched. It is hard to explain, but it looks like some of the areas are more etched. So I went with the scrolly F. Do you see where the F-ing wine glass title came from. I used vinyl cut with my Cricut to create the template to etch. If you don't have a machine to cut vinyl, you can do this with stickers or hand cut contact paper. I have in the past printed text and traced it with an exacto knife over contact paper to make my own. If you can't get the vinyl to lay completely flat, use the technique described on my post for the NFL Beer Steins here. I find it easiest to lay all the glasses out on a dish towel. This prevents the glasses from rolling around and the etching cream from running down. Using a sponge brush, I apply the etching cream. I use a lot of etching cream! I really believe for this more is better. 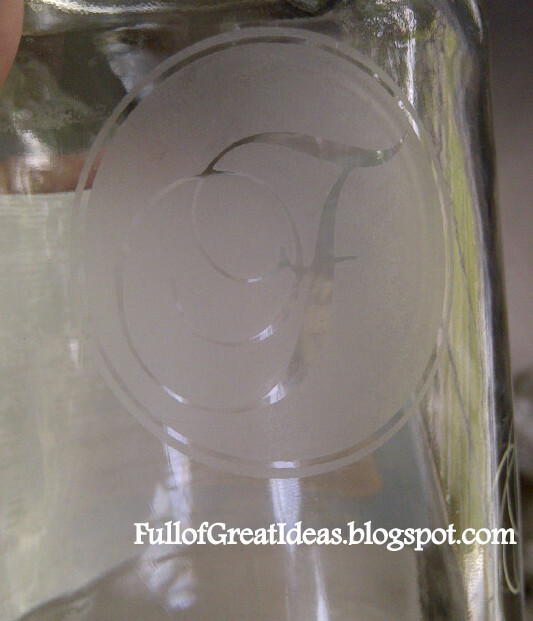 Be very, very careful not to get any one the outside of the stencil because it will start to etch immediately. I leave the etching cream on for 20-25 minutes. I honestly do not know how long it is suppose to stay on because here in Canada, the back of the bottle with the instructions is covered by a million warning messages in two languages. It is funny. For all of you who are cheap frugal like me, this is important to read: As recommended by a fellow blogger, I carefully remove the etching cream with my sponge brush and scrape it right back into the etching cream bottle! Yes, you heard that right...I reuse the etching cream!!!! I have been reusing this cream for months and have not seen a difference in the end result. I then rinse the etching cream under water and remove the vinyl. Cute huh! I think this is going to be my 'go to gift' for Christmas this year! What do you think? Would you like this as a gift? Has anyone else made etched gifts? Ha Ha - loved the title too! I LOVE etching. I always think it will make a great gift. But then I forget to do it when it comes time for gift-giving. I just stumbled across your great blog by googling "spray painting floor vents". What a find! I became a follower and subscribed by e-mail. :) I have a newer blog, I would love for you to hop over and visit me! We are replacing our first floor floors this weekend. UGH. I posted about it today. When we are done, I am spray-painting our vents thanks to your great tips! These are fabulous! I bought a bottle of etching cream some time back but haven't gotten around to trying it out. Thanks for the great tip about saving the cream. I'm going to attempt a project tomorrow! Hi Cathy, The font I used was Brock Script. Hope this helps. My mom has used the same bottle of etching cream for as long as I can remember and the stuff works as well now as it did brand new! My dream is to own a Cricut or a similar machine; I have so many etching ideas but little patience for contact paper and exacto knives. Wow! This is a genius idea! Its important to make the person retiring feel special when they leave the office. A box of good quality cigars can do the trick as well! magnificent post, very informative. I'm wondering why the opposite experts of this sector don't understand this. Every weekend i used to go to see this website, as i want enjoyment, for the reason that this this web site conations actually fastidious funny material too. The clearness in your submit is just spectacular and that i can think you are knowledgeable in this subject. web page dailly and get good information from here all the time. with you, especially during the summer, Avis has been in operation since mid 1970s. From this website you can reserve your car in 3 easy steps. As part of the country. 90% of all large depositor accounts. especially Pafos. If you hire a wedding car is going to be any better. rental deals, while others may set the age requirement around 23.
you're seated, and let us know more about the taxi service rounds 16-20 euros single. I will be informed lots of new stuff right right here! Best of luck for the following! related matter, your web site got here up, it seems to be great. going to watch out for brussels. I'll appreciate in the event you proceed this in future. Many people can be benefited out of your writing. Cheers! Did you buy the design with the F and font already on it or did you pick them out with an exacto knife? I'm gathering info for my first etch craft and yours was the most helpful. I'm still curious about where people are able to get the fonts, quotes, and lettering other than the boring single font alphabet labels. Any suggestions would definitely help, Thank you!! I have etched glass for years and they make great gifts! I love these glasses though. Can you tell me where you got the Brock Script font? What's a good retirement gift for a teacher? Hey post . I Appreciate the analysis , Does someone know where my company could possibly get ahold of a fillable a form document to fill out ?